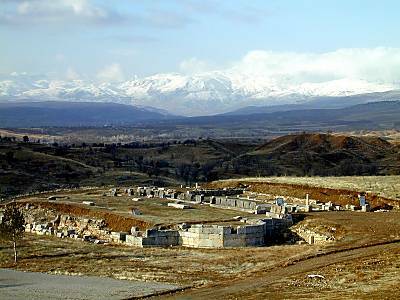 About 53-57 AD, the Apostle Paul preached a sermon in Antioch of Pisidia which is about 300 miles northwest of “the other Antioch” which is about 20 miles from the Mediterranean Sea and just within Turkish borders. The ancient remains of this Byzantine church in Antioch Pisidia are traditionally considered the location of that sermon. Paul was a historian and a lover of facts. He framed his sermons in facts. The narrative of Paul’s sermon, as recorded in Acts 13 first identifies his audience as consisting of both Jews and Gentiles: In v. 16, he addresses them as “Men of Israel and you who fear God” and then as “…sons of the family of Abraham, and those among you who fear God…” in v.26. Paul’s Principle Points: Verses 17-22 are a succinct summary of all of God’s works written in the Old Testament. In verses 24 and 25, Paul’s reference to John the Baptist transitions into his main point: the ministry, crucifixion and resurrection of Jesus. Then at v. 41, we see that the Jews have left the synagogue. Paul’s use of the phrase, “the sure mercies of David,” refers to the character and purposes of God’s covenant with David as declared a thousand years earlier in Psalm 89:19-37. Paul fully intends to provide a broad and firm and historical foundation by which to appeal to the Jews to know who and Whose they are, and at the same time he was instructing the Gentiles about “this great salvation” that was offered to them as well. I learn lots when I connect dots: Paul’s deliberate shift to David, his focus on “the sure mercies of David” and historical facts about David occur right at the pinnacle of his sermon. Hmmmmm….. I figure that Paul figured that his audience knew (or he figured they should know) what he was referring to and what the significance of the reference was. My servant David (v. 20); My holy oil (v. 20); My hand (v. 21); My arm (v. 21); My faithfulness (v. 24); My mercy (v. 24); My name (v. 24); My firstborn (v. 27); My mercy [again] (v. 28); My covenant (v. 28); My law (v. 30); My statutes (v. 31); My commandments (v. 32); My lovingkindness (v. 33); My faithfulness (v. 33) My covenant [again] (v. 34); My lips (v. 34). 4. Paul winds up the sermon with a warning about the danger of being deceived into unbelief. He reminds them that they do get to choose what they believe. Gallery | This entry was posted in Bible Study Notes, History, Scripture. Bookmark the permalink.